When you listen to enough music, you're almost certain to eventually find something that defies any sort of easy description. This little discovery is actually something that one of my best friends, Dave Combs, shared with me many years ago. I was stunned. 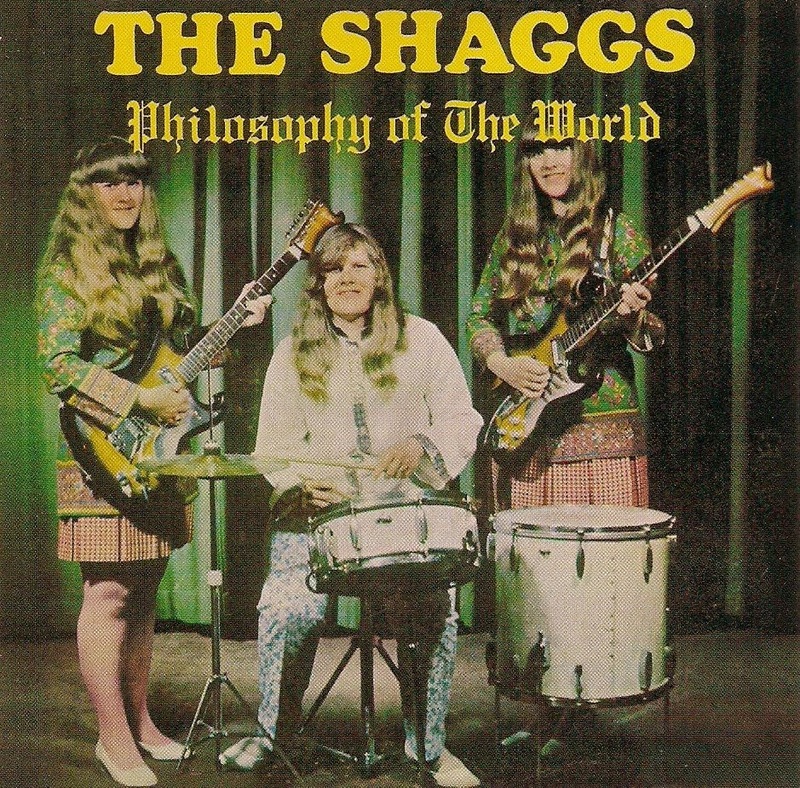 Dot, Betty, Helen and later Rachel Wiggin were The Shaggs, they recorded only one album that was released in 1969 called "Philosophy of the World," and it was an amazing effort. By amazing, I mean that this music breaks every imaginable rule simply by not following any of them. "My Pal Foot Foot," which, if I remember correctly, was a song about the Wiggin family cat, was the tune that Dave played for me. Not one of the young ladies managed to play in the same time signature (or any time signature at all, it seemed). The guitars were tuned to what could generously be referred to as "alternate tunings," and the singing was tunelessly inspired. I loved it. It didn't seem possible that one short song could contain so much weirdness. As one might expect, The Shaggs met with a lot of criticism, a lot of confusion and they were heckled mercilessly when they performed live. But then an interesting thing happened...they began attracting a fan base, especially among the more avant-garde musicians of the time. Frank Zappa was a fan; keyboardist and singer Terry Adams with the great group NRBQ was the man responsible for re-releasing "Philosophy of the World" on his own record label. The Shaggs are a reminder that we cannot all be Beyoncé, and that even if Matthew Knowles were our father this would probably still be true. In the late 60s, Austin Wiggin of sleepy Fremont, New Hampshire, got it into his head that his daughters Helen, Betty, and Dot should form a band. He made them practice their instruments endlessly and do calisthenics and perform in front of their classmates and neighbors in awful, awful matching outfits, and yet somehow they still did not become Destiny's Child. They always looked frumpy and stilted on stage and songs they wrote came out all misshapen and weird. They gave them names like "My Pal Foot Foot", "Why Do I Feel?" and "It's Halloween". Nobody was going to call up the Shaggs and ask them to write a song for the Charlie's Angels soundtrack. But chances are, nobody's going to call you up and ask you that either. I'm sorry to put it in those terms, because I probably don't even know you. But that's the truth. And that's the stinging, still-mesmerizing beauty of 1969's Philosophy of the World, the only record that the Shaggs ever made: With its offbeat rhythms and too-tender musings ("Parents are the ones who really care/ Who are parents?/ Parents are the ones who are always there"), it is utterly impossible to forget that this music was made by humans, and once you get sucked far enough into its vortex it becomes impossible to forget that you are human, too. Plenty of people heckled the Shaggs and even pelted them with soda cans when they played live. But as time went on, Philosophy of the World gained an unexpected and fervent cult following. There are now people who believe that the Shaggs' music was not unsophisticated at all but, like a sound that only dogs can hear, actually too sophisticated for our human brains to comprehend. There are people who believe the Shaggs' odd melodies and bizarre time signatures were secretly referencing Chinese music, or free jazz, or the work of Ornette Coleman. The Shaggs are "better than the Beatles," Frank Zappa famously said. Lester Bangs called their record "one of the landmarks of rock'n'roll history." "Of all the contemporary acts in the world today, perhaps only the Shaggs do what others would like to do, and that is perform only what they believe in, what they feel." Their dad said that last one, because, naturally, he wrote the record's liner notes. The conceptual beginning of The Shaggs came from Austin Wiggin, Jr.'s mother. During Austin's youth she had predicted during a palmreading that he would marry a strawberry blonde woman, that he would have two sons after she had died, and that his daughters would form a popular music group. The first two predictions proved accurate, so Austin set about making the third come true as well. Austin withdrew his daughters from school, bought them instruments, and arranged for them to receive music and vocal lessons. The Wiggin sisters themselves never planned to become a music group, but as Dot later said, "[Austin] was something of a disciplinarian. He was stubborn and he could be temperamental. He directed. We obeyed. Or did our best. "Austin named The Shaggs after the then-popular shag hairstyle and as a reference to shaggy dogs. In 1968, Austin arranged for the girls to play a regular Saturday night gig at the Fremont, New Hampshire Town Hall. On the topic of the album, Cub Koda wrote, "There's an innocence to these songs and their performances that's both charming and unsettling. Hacked-at drumbeats, whacked-around chords, songs that seem to have little or no meter to them ... being played on out-of-tune, pawn-shop-quality guitars all converge, creating dissonance and beauty, chaos and tranquility, causing any listener coming to this music to rearrange any pre-existing notions about the relationships between talent, originality, and ability. There is no album you might own that sounds remotely like this one." At this point, the man who had promised to press 1,000 copies of "Philosophy of the World" reportedly absconded with 900 of them, as well as with the money paid to him. The rest were circulated to New England radio stations but attracted little attention, and Austin's dreams of superstardom for his girls were dashed. The Shaggs never recorded a follow-up album, and they broke up after Austin died in 1975. Their music would live on from time to to time, however, most notably after getting some airplay on the syndicated radio program "The Doctor Demento Show." That's where I heard them for a second time, since I was a big fan of that show. So thanks Dave...this song is still stuck in my head all these years later. For many years, I've fantasized about what the airwaves...and cyberwaves...would sound like if the playlists were populated with music that I thought was worthy of more attention. ...in a perfect world is my modest and totally subjective attempt to share info and insights on bands, music and performances old and new.